Enter the world of a nine year old adult, a twenty-something medical school drop out and a cute little goldfish with an odd name, fast cars, fast tractors in the search of a movies icon in Tramore. This site maps the creative journey to produce and direct this Award Winning Jersey/Ireland co-production. The Crooked Mile DVD is now available to purchase by mail order through our online shop by clicking here. Sales agents, TV channels, Film Festivals interested in this acquisition please email julie@thecrookedmile.com for a screener of the movie. 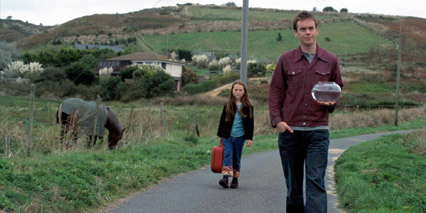 Shot in every corner of the Island, The Crooked Mile took advantage of the diversity of Jerseys' environment to emulate the Irish countryside. Enjoying coverage from both the Jersey and Irish media as well as the professional commentators of the industry, follow the Crooked Mile's journey through the world's media. The Crooked Mile breaks ground as the the first feature outside the USA to receive the coveted Tribeca Award founded by the Hollywood actor Robert De Niro. Find out the gossip and the feeling of the crew as they strolled, or sauntered down the Crooked Mile, stopping for tea in Gorey, Cakes in St.Catherine and beer in St.Brelade with brief work periods between. Keep up-to-date with local screenings and the film's publication on the World Stage.